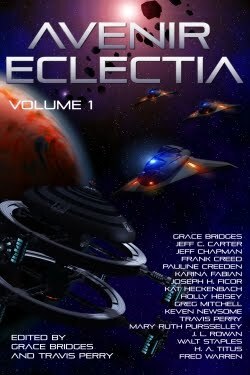 John swirled his vodka, sending the ice cubes tinkling softly inside the glass, as he gazed at Eclectia. It was a putrescent tumor of a world, spattered in ochre and rusty orange. Even the ocean was a murky green-gray, mostly shrouded in clouds of volcanic ash. It looked more like a drainage pond than a living sea. John’s pale, expressionless valet methodically laid three tunics on the bed for his master’s consideration. “It is the only habitable planet within several hundred light years,” he said, without looking up from his task. He returned his attention to the window, and the planet beyond. He sipped his drink. There was nothing but to make the best of it, he supposed. The Founders hadn’t left them any other option. Things could be worse. John Milton thought ruefully of his namesake, who in this time and place might have chosen his words differently. Better to rule from heaven than serve in hell.